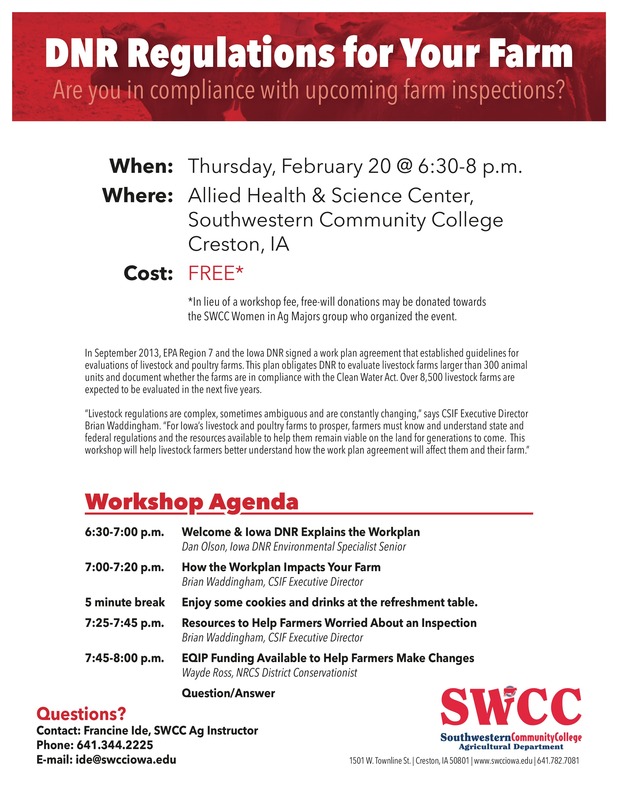 The Southwestern Community College Agriculture Department will be hosting a livestock producer workshop called “DNR Regulations for Your Farm: Are you in compliance with upcoming farm inspections?” on Thursday, February 20 from 6:30-8:00 p.m. at the Allied Health and Science Center on the main campus in Creston, Iowa. There is no cost to attend and light refreshments will be provided. 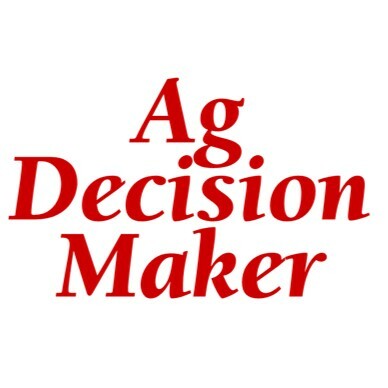 EPA Region 7 and the Iowa DNR recently signed a work plan agreement that established guidelines for evaluations of livestock and poultry farms. This plan obligates DNR to evaluate livestock farms larger than 300 animal units and document whether the farms are in compliance with the Clean Water Act. Over 8,500 livestock farms are expected to be evaluated in the next five years. Guest speakers include Dan Olson, Iowa DNR Environmental Specialist; Brian Waddingham, Executive Director of the Coalition to Support Iowa’s Farmers; and Wayde Ross, NRCS District Conservationist who will explain the work plan, resources available for impacted farmers, and EQIP funding to help producers make necessary changes. 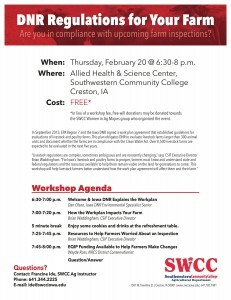 Questions about the event may be directed to Francine Ide at (641) 344-2225 or ide@swcciowa.edu.